The Jhomolhari Mountain Festival was conceived as a Snow Leopard festival with an aim to raise awareness on the importance of conserving the endangered cat species. Six years down the line after the launch of the festival, its goal persists as Bhutan intensifies efforts to conserve the elusive cat and their habitat in the country. 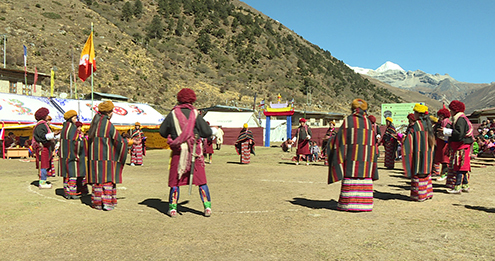 Lingzhi Dungkhag organised the 6th Jhomolhari Mountain Festival from Octobe14-15. It was aptly themed “Celebrating Living in Harmony with Ghost of High Mountains”. “Initially, the festival was conceived as a Snow Leopard Festival to conserve and preserve Snow Leopards in the high mountains of Lingzhi frontiers so that the local people coexist with the animal. The theme and objective remains the same today,” Lingzhi Dungpa Mani Sangye said. Solitary, almost silent and majestically beautiful, the snow leopard is one the most enigmatic cats. It is also one of the rarest and threatened. The Jhomolhari Mountain Festival is particularly aimed at conserving snow leopards in the mountains of Soe, Naro, Lingzhi in Thimphu and Yaktsa and Nubri villages of Tsentok Gewog in Paro. The predator is often hunted for its fur, bones and organs. Human-wildlife is another threat to its existence. “The festival aims to raise awareness on the importance of coexistence. Human-wildlife conflict where the farmers kill wild predators in retaliation to livestock deaths and crop destruction they cause threatens their existence,” the Dungpa added. An ambitious countrywide estimate of the snow leopard population carried out in 2017 found 96 snow leopards in Bhutan. And Lingzhi is home to more than 24 of them, according to the 2016 Snow Leopard Survey. “The snow leopard is an important animal in our ecosystem. They are an indicator species of the health of mountain ecosystem. Its presence across the country is a sign that much of Bhutan’s high-mountain eco-system is healthy. It’s important that we celebrate snow leopard and raise awareness on the importance of its conservation through the festival,” Thimphu Dzongda Dorji Tshering said. The Jhomolhari Mountain Festival also brings together the people of Lingzhi, Soe and Tsentok Gewog of Paro. The festival is a visual treat with various cultural performances native to these gewogs on display. The two-day festival is emerging to be a tourist attraction as well. It also draws locals. Over a hundred people, including both locals and tourists, trekked up to Dangochang in Soe Gewog, Thimphu last month for this year’s festival. But the number of visitors this time was less than expected. This year was also the first time Lingzhi Dungkhag took charge of organizing the festival. The earlier editions of the festival were organised by the Jigme Dorji National Park with financial support from the Tourism Council of Bhutan (TCB) and the Bhutan Foundation. Lingzhi Dungkhag Administration, along with Soe Gewog, will strive towards sustaining and strengthening the festival. The 6th Jhomolhari Mountain Festival was financially supported by the TCB, Bhutan Foundation and Novel Travellers. 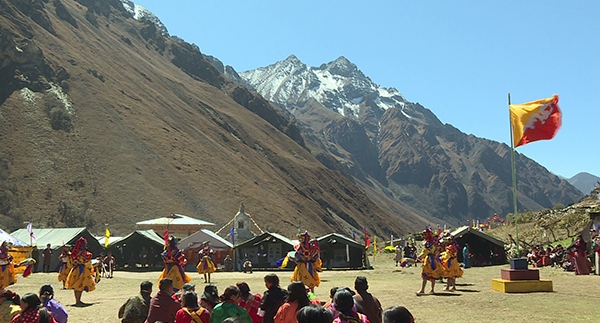 The first Jhomolhari Mountain Festival was held in 2013.